Just prior to the earnings announcement, Wachovia Capital Markets came out with positive comments. The analysts say NIHD is poised to take advantage of 2 new cellular handsets and continued strength in the company's Brazilian market. 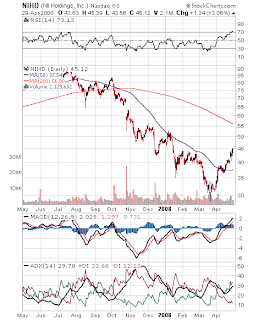 Wachovia reiterated its "outperform" rating on NIHD, noting that the recent sell-off was dramatically overdone. How did I become aware of this stock? I run the TradeRadar Alert HQ process every weekend and scan over 7200 stocks and ETFs. The process applies a number of technical analysis criteria to the price/volume data and generates a list of BUY and SELL candidates. NIHD popped up on the list for the week ending April 18. Looking at the chart, it is clear that it matches the typical criteria we look for. The stock had been in a prolonged downtrend which appeared to have ended. The TradeRadar BUY signal in combination with trend analysis, confirmation from Aroon analysis and verification that the stock was trading above its 50-day moving average identified NIHD as a potential winner. Reviewing Chaikin Money Flow (over 0.2), DMI/ADX (clearly bullish), PE (modest) and PEG (well under 1.0) further confirmed the BUY signal. Since April 18, the stock has moved from $40.18 to $45.12, a 12% advance as of the close today. I see, however, that the stock has tumbled in after-hours trading to $43.994, erasing much of today's gain. None of the telecom ETFs have shown any significant negative action after hours so I'm thinking this is company specific. What's in store for NIHD? Probably some further weakness. The stock is overbought. Technically speaking, it is pushing the upper Bollinger Band and the RSI has moved into overbought territory. The stock is up almost 50% from the bottom established in March. It would not be a surprise to see a pullback. On the other hand, the company is operating in a part of the world that has undergone significant growth. Latin America has benefited from the rise in commodity prices and, as a result, local economies have been going strong. As in India and China, a growing middle class is emerging as consumers. Odds are this process is by no means over. NIHD should be able to ride this wave. Wall Street remains positive on the company. Zacks reports that NIHD has been awarded 8 "strong buy" ratings, 2 "holds," and 1 "strong sell." NIHD just launched a stock buyback program, something that most other companies these days have started to curtail. A pullback now should be considered another buying opportunity.